And….we’re home. *happy sigh* What an amazing week. 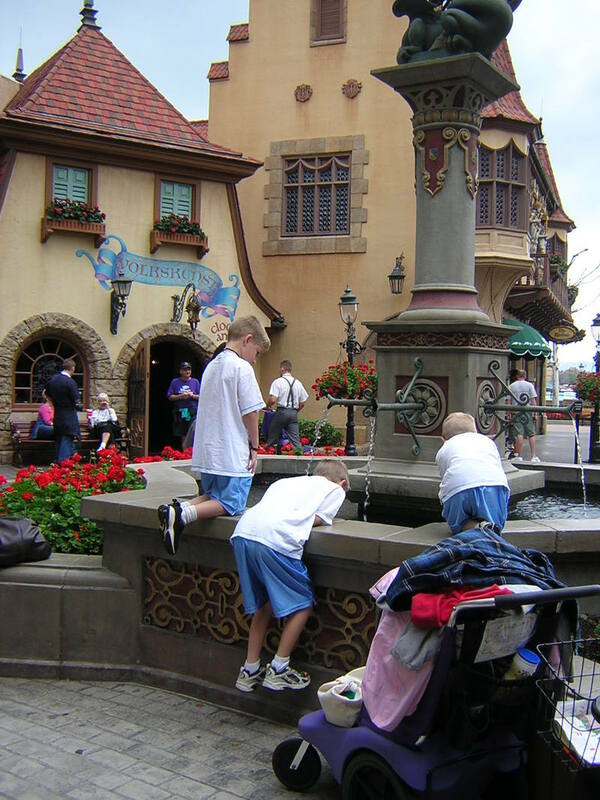 The front half of Epcot, if you’ve never been there, is a wonderland for imaginative kids. My boys wanted to see and touch EVERYthing, and we darn near managed it. The highlights of the day was a virtual hang-gliding journey in Soarin’, and Hubs and the two younger boys raved about the ride Test Track (Adam and I sat that one out). On to Friday…our last day at the park. We woke up early, packed, and headed out to Animal Kingdom for a character breakfast with Donald Duck. Mickey, Goofy and Pluto were there as well. We saw the Festival of the Lion King, a shortened version of the Broadway play…OH, MY GOSH! It was breathtaking. We met a few more characters and then took the Monorail back to the Magic Kingdom (we were able to sit up front with the driver–a real thrill!). That last day at the Magic Kingdom was so full I don’t even know how to summarize it. We saw everything we wanted to, and a few things twice. The weather was perfect. I bought a much-cherished souvenir–silhouettes of my boys made at Liberty Square. Hubs and Adam were even able to get reservations for the Pooh character lunch Adam missed on his sick day. Things were going SO well. We ate dinner at Pecos Bill’s, with plans to watch the Spectro Magic parade and fireworks show again before climbing in the car to make the drive home. After dinner, we sat leisurely in the restaurant, until our nasty little stomach bug made a VERY sudden appearance with ME. With the room (literally) spinning, I ran to the bathroom, where I camped out for a very long time. Remarkably, I never actually threw up (because I’m sure you were wanting to know), but I hovered on the edge of death in that bathroom–or so it felt. I knew I would have to somehow make it out of the park, but I could barely pull myself off the floor. Finally I stumbled out to our table, where my sweet Hubs had four Disney bags cleared out and ready for me to chufe into as we dashed out of the park. Just as we attempted our sailing exit out of the restaurant…THE PARADE STARTED. You Disney veterans know that nothing short of nuclear war could interrupt a Disney parade. So Hubs somehow managed some creative steering through stores and alleyways, dragging three boys and a very green momma behind him. Who needs a "Prince Charming" when you have the real thing? What a guy! Long story short, we made it out of the park and to our car with no embarrassing, um, "episodes". We only drove an hour out of Orlando before we all collapsed into a hotel bed from exhaustion over the drama. True to the form of this virus, I was fine the next morning. Our trip back was safe and uneventful. My boys mercifully have overlooked our less-than-stellar parting from Disney World and have talked non-stop about their happy memories. Their hearts and autograph books are full! Really, stomach virus and all, we couldn’t have had a better week. We are so blessed! Now we’re home, and my house is piled high with dirty laundry, suitcases, and a wide assortment of souvenirs that seemed like a good idea at the time. My daughter had a wonderful time with my parents (though it took her about 30 minutes to decided if she still liked us! ), and my house seems enormous to me after 10 days in a hotel room. It’s a happy night indeed. Thank you to those of you who read along and gave encouragement and prayers during our wild week! It was fun to share it with you. Bear with me; it may take me all week to catch up on comments, e-mail and other blogs! I missed my blogging friends even more than I expected I would–y’all are the best! Signing off, for some laundry and rest…. Nooooo! I was so sure you’d make it without catching the dreaded virus. I’m glad you had already seen the parade and even happier that the boys did throw a fit about your departure. You have such a remarkable, lovely family! Can’t wait to see the pictures, sovenirs, and YOU! I’ll be happy to have the kiddos over this week if you need to work on laundry. Shannon – just wanted to tell you how fun it was to travel with your sweet family. Lots of great memories! And thanks for the blog cameos! I want a chilihead friend – I’ve got mounds of laundry too! “everyone was able to stomach his schnitzel” Classic. It’s good to have you back. Get some rest, you deserve it, Super Vacation Mommy. Glad your trip was so lovely!!! So glad you’re feeling better!! And so ecstatic that overall it was a wonderful trip for you and your family!!! Welcome Home!! Welcome BACK!! Sounds like a total blast!! So fun to hear about your trip! Welcome back! Yeah! Back to the comforts of your own home. You had such an amazing trip, and a great attitude through the more “feeling green days”. I felt the same way about Epcot Center. When I went there in my youth, it was awesome. Hubby and I dragged seven exchange students there years back, and they hated us for not taking them to Universal Studios. I’m such a square, I didn’t even know what Universal Studios was! Will have to do better research for our next trip that way. Do they still have the Tarzan show? I agree, Lion King AND Tarzan are spectacular shows….and you get to sit down for a bit! So glad you shared your trip with everyone…it was like I was there again! Thoroughly enjoyed hearing about the trip. Glad you are home safely and sans sickness. Now the reality sets in. Take the laundry a little at a time, mingled in with many revisits to pictures and souvenirs — to remind you of why you have such a Mt. Washmore to tackle. Welcome home. Glad it was a fun trip…well, mostly. Get some rest and do some laundry! Welcome home, friend! I’m so sorry you got … THE BUG … but it sounds like you had a wonderful, memorable, and blessed vacation with your boys. Can’t wait to see pics and to hear all about it. Have fun with that laundry … if I was closer, I’d offer to help… I’m sure you already know this (what, with FOUR kiddos), but take Chilihead up on her offer… it makes laundry much more easier to do when there aren’t any little ones under foot! Glad to hear you had so much fun. It sounds like a trip to be talked about for years to come!! Hooray! I’m so glad your trip was pure magic and that you’re all home safely!!! Sounds like a great trip! Welcome back! Welcome back! Glad it was wonderful! i hope you rest THEN do laundry! We had such fun babysitting! She’s such a sweet baby, and it was a joy to have all that time with her. We probably sent her home a little spoiled, but isn’t that what we’re supposed to do?? We are so glad y’all got to go….the boys are the perfect ages for Disney, and we got to enjoy little sister! I’ve loved reading these posts about your trip. My parents keep talking about going next year with the oldest grandchildren (will be ages 6 & 5). Glad you had a great time and more importantly, glad you paid that $10/day so we could get the blow-by-blow. ps…I’ve gotten my brother and my mom now hooked on your blog.